RSS feeds are a great way to keep up-to-date with news from your favorite websites. This icon commonly indicates an RSS feed. An RSS document, called a "feed," is a syndication of information supplied by a website. Anyone with an RSS feed reader can subscribe to an RSS feed; once subscribed, the reader checks for new content and updates as it becomes available. This makes it easy to keep up-to-date with changes without needing to manually visit the website every day. 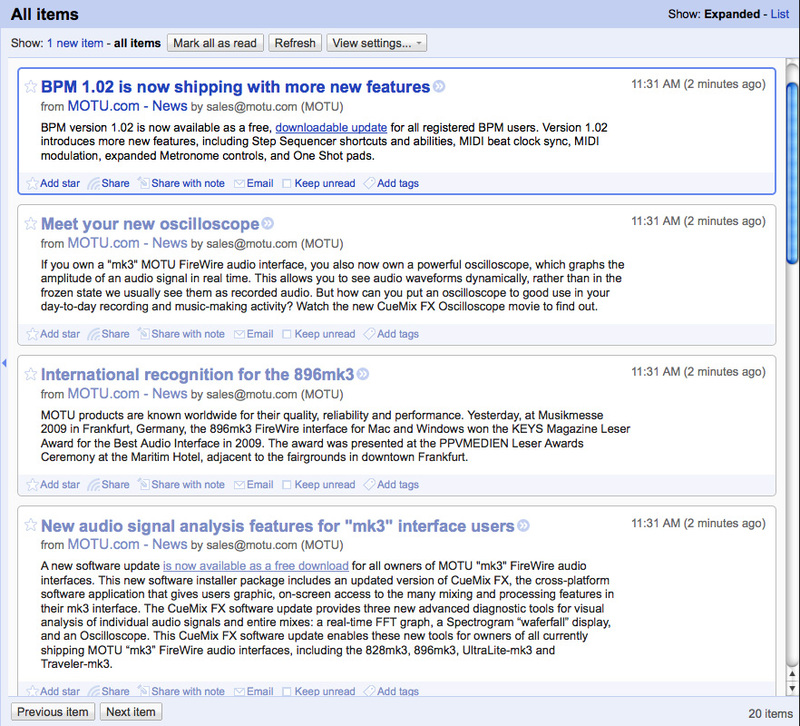 For example, the MOTU.com News RSS feed updates every time a news story is added to MOTU.com. If you are subscribed to that RSS feed, the next time your RSS reader checks for updates it will notify you about the newly posted story, usually providing the title, a description, and a link to the full article. RSS readers can be found within many popular browsers, including Firefox, Safari, Internet Explorer 7, and Opera. Viewing or subscribing to an RSS feed is often as simple as clicking on an RSS icon in the address bar. There are also a variety of online RSS readers, such as Google Reader and My Yahoo, which allow you to view results from RSS feeds online so you can view your RSS feeds from anywhere, not just your regular computer. Email clients, such as Thunderbird, Apple Mail 3.0, and Microsoft Outloook, also often have RSS readers integrated so new messages appear similar to new emails.